The popular wisdom is that the cost of solar energy has come down so much -- solar panels cost about 100 times less today than they did in 1977 -- that the opportunity for further reductions has been all but exhausted. The general thinking is that the path to further cost reductions is through reductions in “soft costs” such as labor, customer acquisition and permitting. However, this is not the case. The most common semiconductor material for solar cells, which are the building blocks of solar panels, is silicon. Because silicon accounts for up to 75 percent of the cost of solar cells, any improvements in silicon cell production technology can further drive down solar hardware costs. One of the major cost-determining steps in the manufacture of solar cells is solar cell metallization, or the use of conductive inks to print grids on the surfaces of solar cells that draw the current off to an external electrical circuit. Currently, most solar cells are printed using traditional screen (or stencil) technologies in which the screen comes in contact with the cell. Because of the mechanical forces involved, screen-print metallization results in a high level of breakage (up to 5 percent), which represents a waste of valuable silicon. Moreover, the mechanical pressure that is applied to the wafers does not allow for reductions in their thickness. An alternative is non-contact digital inkjet printing, which saves on silicon by reducing breakage. In addition, digital inkjet printing enables the reduction of wafer thickness, which also cuts costs by reducing the amount of silicon required. A major barrier to the adoption of inkjet printing technologies, however, has been the lack of conductive inks with the needed properties. 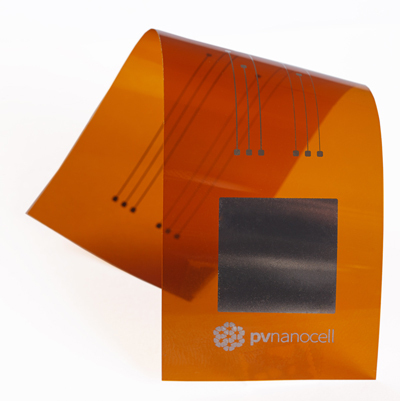 PV Nano Cell has addressed this need by developing the Sicrys™ family of single-crystal silver nanometric conductive inks, which cut solar cell energy costs by 10 to 20 percent. In addition, we have developed the world’s first copper nanometric conductive ink, which delivers the outstanding properties of silver ink with even greater cost efficiency because of the lower metal cost. The development of conductive inks for use in digital inkjet printing also saves money in other ways. The first is efficiency: with increased solar cell efficiency, fewer cells are needed to harvest the same amount of energy. Because the digital printing technology enabled by PV Nano Cell’s inks allows for narrower conductive patterns, less of the cell’s surface is covered by ink, allowing more sunlight to penetrate. 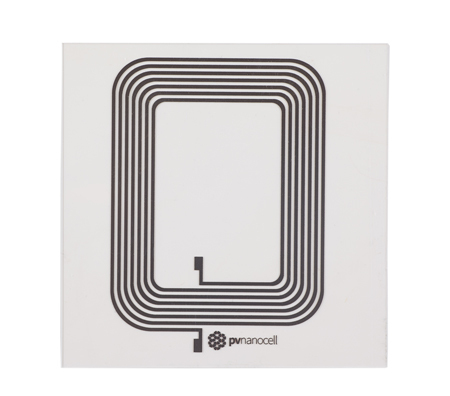 This increases cell efficiency by at least 0.3 percent and up to a percentage point by comparison with cells printed with traditional screen-printed conductive inks. In addition, the small particle size and uniform dispersions of PV Nano Cell’s inks increase conductivity, which also increases efficiency. Finally, the narrower conductive pattern means less silver is needed, which saves on material costs. In addition to the metallization of crystalline silicon solar cells, Sicrys™ inks are the enablers of the implementation of digital conductive printing in mass production applications in many fields including antennas for Internet of Things (IoT) devices, antennas for mobile phones, flexible and customized electronics, 2.5D and 3D printed electronics and more. The printed electronics market is growing rapidly: it is predicted it will grow at a compound annual growth rate of 33.8 percent from 2014 through 2020, reaching $40.2 billion by 2020, according to a 2014 market research report, with more and more innovative applications moving toward commercialization, including those in the printed memory, touch sensor, smart packaging, biomedical, wearable device, radiofrequency identification tag, novelty, organic photovoltaic, automotive, smart card and organic LED sectors. The solar industry is growing rapidly as well, although it made up only 0.4 percent of the nation’s energy supply in 2014. If solar is ever to make up a meaningful part of the nation’s energy supply, it will need to become cost-competitive with electricity from the grid in most regions of the country. Reducing “soft costs” is one route to bringing down the cost of solar, but there is also room for further reductions in materials and process costs that can be realized through the implementation of cost-effective non-contact digital inkjet printing technologies. With solar on the cusp of economic feasibility in many areas, incremental cost reductions such as those offered by digital inkjet printing technologies can make the difference between moving ahead with solar and sticking with electricity from the local utility. The impending implementation of digital inkjet technologies means that solar will become competitive with retail electricity for thousands more businesses and homeowners, allowing them to save money on energy costs and to tap into a clean, renewable source of energy. PVN’s Sicrys™ technology can be used to make flexible, thin antennas. PVN recently entered the U.S. printed electronics market with their Sicrys™ nanometric inks.